Soldiers attacking and defending Petersburg in mid-June 1864 had more to contend with than the enemy’s artillery and musketry: both sides had to operate in almost unbearable heat. The southern sun had been unquenched by rain, and drought conditions covered everything in thick dust, stirred by the movement of thousands of men and horses. In these trying circumstances it is not surprising that the combatants took note of a structure unfamiliar in today's world, but relatively common and recognizable in the nineteenth century; an icehouse (see the link above for pictures and a map of the icehouse). There has always been something chilling about ice-houses….they can cheat Nature, providing ice in seasons when none should exist at all (p 206). The best site for an ice-house is at the summit of a steep declivity, with a northern aspect. If there be trees about it, so much the better. 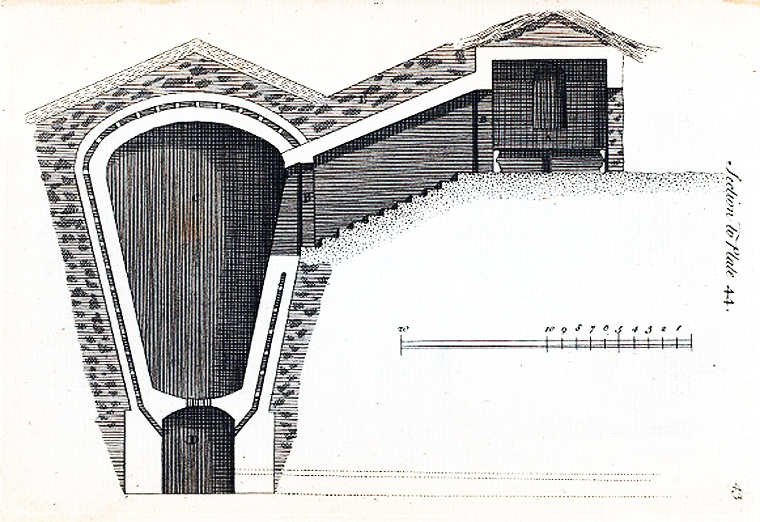 When the pit is excavated it will not be a difficult matter to cut a drain on a level with the floor, either by ditch or tunnel (p. 370). proposition was no sooner made than it was carried out, and the lemonade was prepared. Some wanted a "stick"
the meanest thing I ever knew the rebels to do ! " We finished our drinks without further molestation (305-306). History of the Sixth New Hampshire Regiment in the War for the Union, Lyman Jackson and Amos Hadley: 1891. June 27.—Some of our men run across a lot of ice the other day, near the railroad. It is in a bad place to get at, on account of the rebel sharpshooters, but there is a pile of it there, and the boys will have it anyway. It seems to last well, and I hope it will while we stay here (465-66). for us that they are inside our lines [excerpt from diary of Sgt. Major Franklin H. Foster] (474). A History of the Ninth Regiment New Hampshire Volunteers. Edward Lord, ed., 1895. “The Taylor House near which we were stationed had formerly been a hotel, but when we went into position [June 23], the buildings had been burned. There was a trotting course here, and the place was the resort of horseman and others from Petersburg and elsewhere. Near by was a large and well-filled ice-house, and when we made our advance, this icehouse was between our lines near where our corps joined the Fifth. It was a treasure worth contending for, and one day after quite a skirmish, in which we lost several men, we succeeded in bringing it within our picket line. This ice lasted us nearly two weeks, the two corps sharing it alike. A portion of it was taken to the hospitals. So vexed were the Johnies at its loss that they fired upon every one who approached it.” William Barry Lapham, My Recollections of the War of the Rebellion (1898), pgs. 132-133. No. 218. Reports of Captain Adelbert B. Twitchell, Seventh Maine Battery. SEVENTH MAINE BATTERY VETERAN VOLUNTEERS, Near Petersburg, Va., August 8, 1864. On the night of the 14th of June my guns were placed in position near the James River. Crossed the James at 7 a.m. June 15, and went into park at 8 a.m. Joined the division at 12 o'clock at night and arrived in front of Petersburg at 4 p.m. of the 16th. One section was sent out during the night to report to Captain Roemer, chief of artillery, Third Division, and on the morning of the 17th another section was sent to the front. On the afternoon of the 18th, when the Ninth Corps drove the enemy across the railroad, my battery was ordered into position in rear of the line of the Second Division, on the crest between the belt of pine woods that extend out to the turnpike road, and the small clump of pines to the rear and right of the Taylor house. I kept up a constant fire during the afternoon to prevent the enemy from strengthening his works, and to assist our troops to advance. At night threw up a redoubt for all my guns. The evening of the 20th, when the Third Division moved to the right to relieve a division of the Second Corps, my battery was put in position to the left of the Hare house. The battery was within 300 yards of the enemy's line, and I opened fire several times on their works. During the night of the 23rd the division moved to the left, and with four guns I relieved Mink's battery, of the Fifth Corps, placing my guns in a redoubt to the right of the brick wall or the Taylor house. Tuesday, June 28, the left section was placed in position on the hill to the left of the turnpike road. The position is a commanding one, and has since been occupied by two batteries. present month. I opened fire occasionally from my guns when it seemed advantageous and necessary, and whenever the enemy made any unusual move or demonstration. The 22nd of July the enemy opened with musketry and occasionally with artillery, and my guns replied spiritedly. During the first day of the month of July I had one guns dismounted as a mortar, and experimented with it successfully the result of which I have forwarded in a written communication to Lieutenant- Colonel Monroe, chief of artillery, Ninth Army Corps. My command has been highly fortunate during the forty-seven days at the front, having suffered but little in killed and wounded. SEVENTH MAINE BATTERY, Near Petersburg, Va., August 3, 1864. I had one section of guns on the front line near and to the left of the ice-house, one piece bearing on the ravine to prevent the massing of the enemy's forces there, and the other bearing on the enemy's fort to the left of the turnpike road. I had one piece to the left of the Taylor house and just to the right of the turnpike bearing up the road to the left of the fort that was mined. At 7.30 a.m., by orders from General Burnside, I put one piece in position in a redoubt to the right of the Taylor house (from which position four of my pieces had been withdrawn the previous night, anticipating that the fire from the fort would cover all the ground) bearing directly on the embrasure from which one gun was throwing shell and canister upon our force occupying the crater and upon the supports. My guns opened fire immediately on the mine being sprung. The guns on the front line threw shot and shell against the parapet and embrasures of the work in their front, and during the continuance of the firing almost defaced the work, rendering it impracticable for the enemy to fire from the embrasures fronting our line. The gun on the right of the turnpike opened with spirit on the right salient angle of the enemy's fort to the left of the turnpike and continued firing at regular intervals during the engagement, occasionally turning the fire more to the right when the enemy opened upon our advancing columns. The piece put into position to the right of the Taylor house opened fire about 8 a.m., and after a well directed fire of about thirty minutes the rebel gun ceased firing for a time and opened only occasionally afterward and at long intervals. I think that the piece in this latter position disturbed the enemy's fire materially as the projectiles could be thrown directly into the embrasure. I lost 1 man killed during the action. Ammunition expended: Solid shot, 142; case-shot, 71, shell, 76. O. R. XL Part II, page 604. "HEADQUARTERS ARTILLERY, NINTH ARMY CORPS, Before Petersburg, Va., August 5, 1864. CAPTAIN: I respectfully forward the following report of the operations of the artillery of this corps (the Ninth) during the assault upon the enemy’s position July 30: The position of the batteries was as follows: Thomas (Second Maine) battery on the right on the front of the First Division, Rogers (Nineteenth New York) and Jones (Eleventh Massachusetts) batteries on the front of the Second Division, and to the rear and left of the place known as the Old Barn, and to the right of the covered way leading to the mine; Start’s (Third Vermont) and Durell’s (D, Independent Pennsylvania) batteries in the heavy work on the left of the same covered way and in the rear of the Taylor house; Roemers (Thirty-fourth New York) and Mayos (Third Maine) batteries in the work on the knoll to the left of the Petersburg or Jordan road; Twitchells (Seventh Maine battery, one section on the front line to the left of the ice-house bearing upon the ravine in front of the Third Division, one gun to the left of the Taylor house bearing upon the Petersburg road, and one at the right of the house. Two Coehorn mortars were in position at the Old Barn, two confronting the work blown up and two just at the right of the Petersburg road. Eatons (Twenty-seventh New York), Rhodes (E, Rhode Island), Wrights (Fourteenth Massachusetts), and Hexamers (A, New Jersey) batteries were held in reserve at convenient points to be taken down the road to the crest in rear of the enemy’s works should our infantry gain that position." Lt. Col. J. Albert Monroe, chief of artillery. OR vol. 40, pt. 2, 599-600. (To my wife.) Before Petersburg, Va., ) July 2nd, 1864. 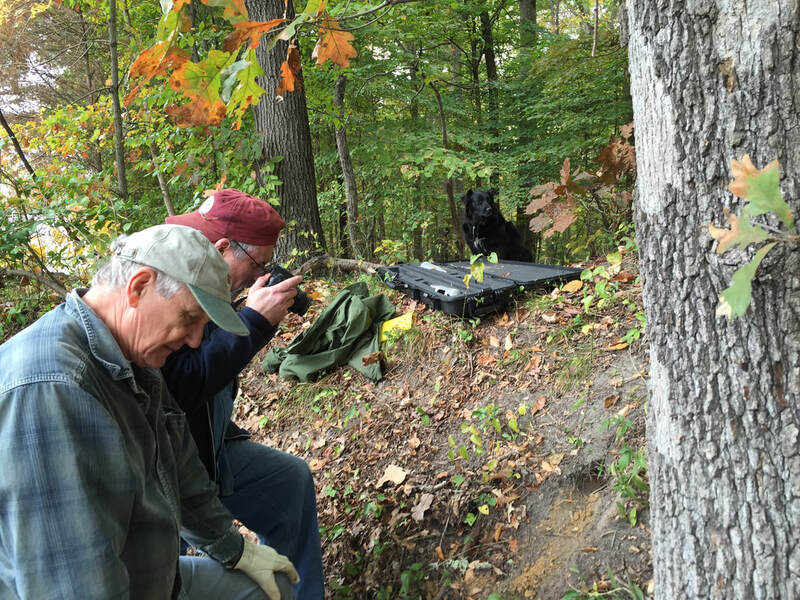 "We are again out of those hot trenches and back in the woods. If the army remains here, in six days we will go out again for a tour of duty in the trenches. There is not so much shooting now, although every few moments a huge mortar shell fired by the rebels, comes straight down from the clouds and bursts with a terrific explosion in our lines. The weather is very hot, but I get ice every day and plenty of it. There is an ice house on our skirmish line. I have some boys who have the nerve to go out and get the ice at night, in spite of the fact that rebel sharpshooters keep a constant fire on the ice house. There is one good thing, corps headquarters can't put a guard over it, and gobble it away from us, and appropriate it to their own use. William wants very much to come home with me." Service With the Sixth Wisconsin Volunteers. Rufus Robinson Dawes, p. 298. Lieutenant Floyd, of Elliott's Brigade, on the Confederate side, writes of being sent to "the Ice House ravine" (p. 181) to rest for a few days after federal assaults on June 19th, 1864. Elliott's brigade was near the Baxter Road during this time period and the reference may refer to the ice-house(s) discussed here. Lowe and Shiman examining the interior of the ice-house. Just where our line of battle crosses the RRoad is a large Ice house full of Ice, it was put up for Market. There is quite a Stream and by daming it up at different points they had Succeeded in packing quite a quantity of ice this house is 30 x 40 with from 5 to 6 ft of ice it is in layres about 4 in thick. Our boys go for ice every day and when there is many of them got in the Rebs will open on them with Artillery. They are at it Now and the boys climb up the Steps with a big chunk of ice and Shake it at them and when they See the flash run down where they of course are perfectly Safe. "Ice House, Lydiard Park Mansion, Swindon." English Heritage. 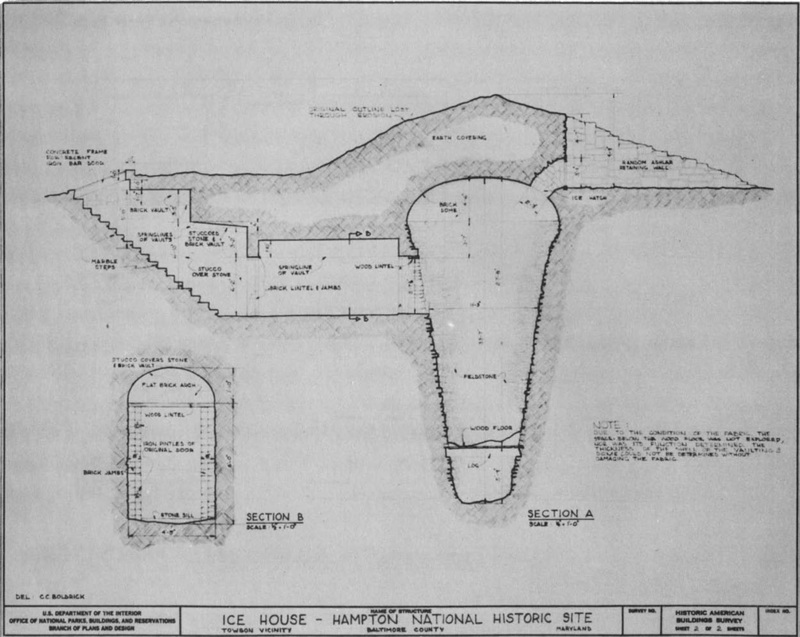 "Cross Sectional View of Ice House Plans, Early 19th Century"
"Ice House. Hampton National Historic Site." Historic American Building Survey, National Park Service. 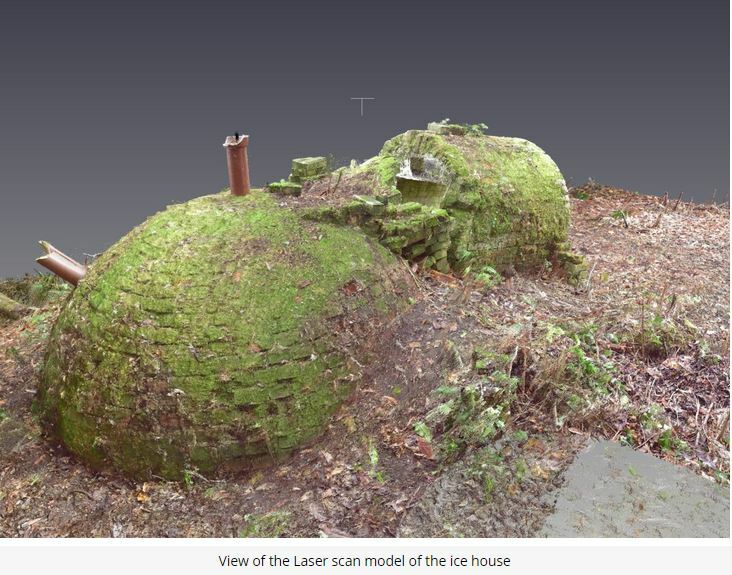 Three-dimensional laser scan of a early- to mid-nineteenth century icehouse at Beaulieu Estate, Hampshire. Posted by archaeovision.eu. 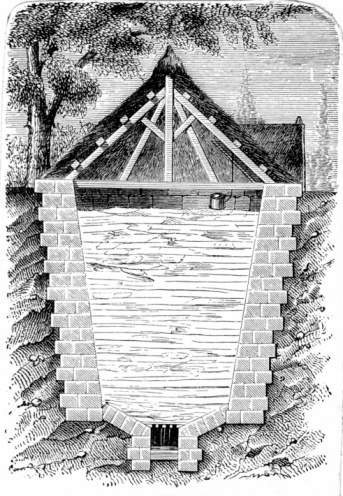 A pre-Civil War ice house in Fredericksburg, Virginia. Courtesy Central Rappahannock Regional Library.